Subscribe now and get all of our great content! 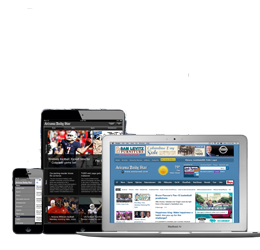 Stay informed of local news and get the best business and sports coverage delivered daily. Includes unlimited access to tucson.com content, all apps, e-Edition and archives back to 2007. Make it a long weekend with Caliente, sports events, features and ideas for family fun. Includes unlimited access to tucson.com content, all apps, e-Edition and archives back to 2007. Enjoy both your weekend mornings! Saturday fun, plus all of the features, content and circulars in our biggest paper of the week on Sunday. Includes unlimited access to tucson.com content, all apps, e-Edition and archives back to 2007. Get all of the features, content and circulars in our biggest paper of the week. Includes unlimited access to tucson.com content, all apps, e-Edition and archives back to 2007. Our Couponer Special! Get the grocery ads on Wednesday and all of the features, content and circulars in our biggest paper of the week on Sunday. Includes unlimited access to tucson.com content, all apps, e-Edition and archives back to 2007. Get the grocery ads on Wednesday, Saturday fun, plus and all of the features, content and circulars in our biggest paper of the week on Sunday. Includes unlimited access to tucson.com content, all apps, e-Edition and archives back to 2007. 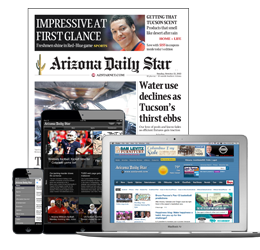 Includes unlimited access to tucson.com content, all apps, e-Edition and archives back to 2007.